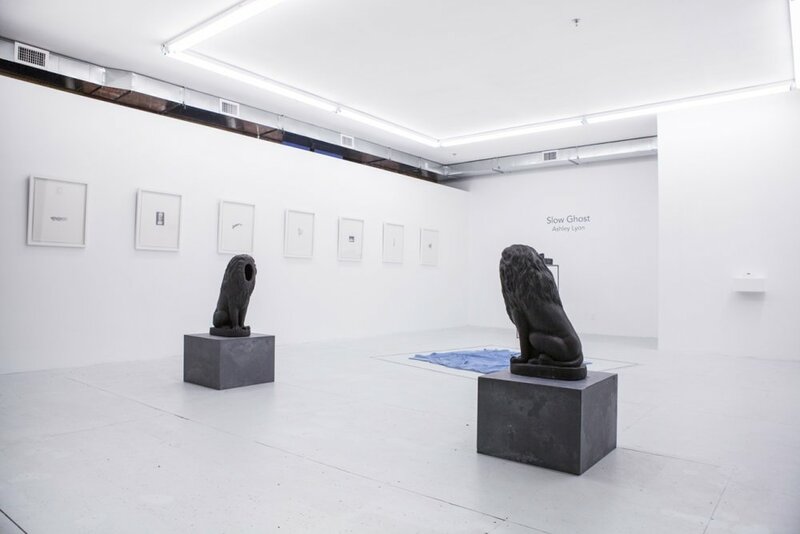 T+H Gallery is pleased to announce Slow Ghost, a solo exhibition of recent and new work by Ashley Lyon, comprised of sculptures and works on paper. This is her first solo exhibition in Boston, on view at 460 Harrison Ave, C19 & C20. Slow Ghost is a grouping of hand-made everyday objects, images, forms, and artifac­ts that often function benignly in the periphery of our perception or cognition. Sourced from online images, iPhone snapshots, the news and social media, visited places and real objects, these various artifacts, collaged in both two-dimensional and three-dimensional space, entice through their physicality. Their delicate rendering evokes an uncanny semblance of the original forms while also exhibiting a gesture of empathy through slow and evident labor. As a collection of isolated fragments culled from seemingly temperate forms and images, (a soft blanket, classical statuary, elements of the human body, pixelated or overly Xeroxed appropriated images and clippings…) they seek to suggest more than their iconographic weight. Freud described the concept of the uncanny with the German word “unheimliche”, suggesting a potent combination of that which is unknown, strange, grotesque, or haunting, and yet also eerily familiar. This paradoxical sensation, infused into the work through fabrication and presentation, pulls at our gut and reminds us of our fragile human tenderness in moments of intimacy, fear, happiness, grief, love, lust, and death in this era of virtuality. Born in 1983 in Palm Springs, Lyon received a BFA in ceramics from The University of Washington in Seattle in 2006 and a MFA in Sculpture + Extended Media at Virginia Commonwealth University in 2011. She has been awarded residencies at the Archie Bray Foundation, Anderson Ranch Arts Center, the European Ceramic WorkCentre and Bemis Center for Contemporary Arts, and received the Elizabeth Greenshields Grant in 2011 & 2014. Lyon currently works as an Assistant Professor at New Jersey City University and is also the co-founder and co-director of the Belfry, an artist-run exhibition venue in a repurposed Methodist Church located in Hornell, NY. Lyon’s work is shown nationally and internationally.